George and Ruby Glass have been sweethearts since high school in Paris, Texas. 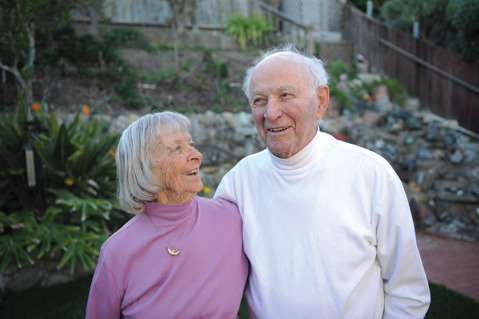 The couple married in November 1942, moved to Goleta in 1944, and have been here and together ever since. It’s hard to believe that Ruby and George Glass are still living in the Mesa house they bought more than six decades ago. Perhaps harder to believe is that the spunky couple are both 89 years old, and have been married for 71 years. Marine Corp base there. He was shipped off to Guam but returned to the South Coast after World War II ended on his birthday, August 14, 1945. A few years later, the GI Bill got them their first house ​— ​the one they still live in today. Santa Barbara was quite bare when Ruby and George arrived; few houses dotted the Riviera, the UCSB campus was an Air Force base, and the population of Santa Barbara was just over 30,000. Modesty aside, Ruby and George have adventures to boast about. The pair spent 7,161 miles on a Honda CB1100, only stopping to pitch a tent along the way. And that was just one trip. “Ruby went through menopause on a motorcycle,” George said, and they both laughed. In addition to bike trips, the pair has been on 20 lengthy sea cruises and has walked on every continent except Antarctica. They got back from Cairo, Egypt, just a month before the city’s 2011 uprising. Such verve is even clearer when you look at their work at Pine Mountain Club, where the Glasses built an entire two-bedroom cabin ​— ​from pouring the foundation and installing the septic tank ​— ​and took their grandkids once their boys had families of their own. “If you see them, you will know that this is a couple that, after 71 years of marriage, there is still a spark there,” said Tom.